Opportunity for fan photos/videos to be featured on TV & social media! 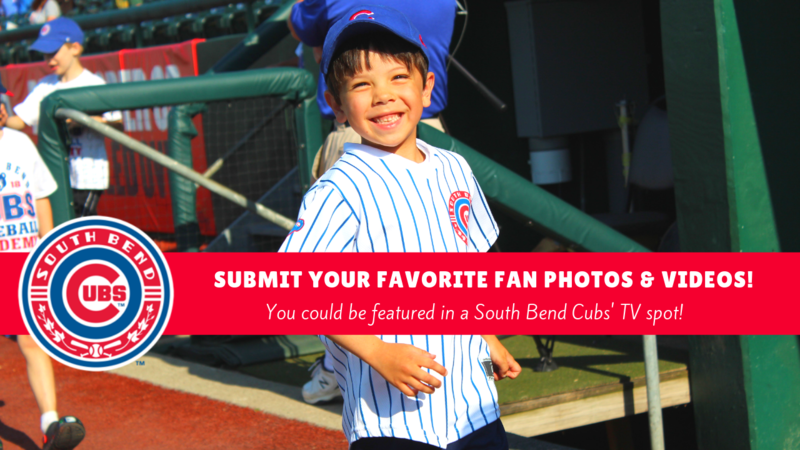 The South Bend Cubs are pleased to announce an opportunity for fans to be part of the upcoming baseball season by submitting their favorite fan photos and videos taken at Four Winds Field. President Joe Hart said a select number of fan photos will be used in promotional materials like television commercials and print advertising. Others will be displayed throughout the season on the jumbo video-scoreboard. Fans can visit MySouthBendCubs.com to upload their favorite fan photos and videos. Submitted materials should include fan gear, or have been taken at Four Winds Field. Fans can continue to upload their photos and videos to the website or via Facebook, Instagram and Twitter using the hashtag #mysouthbendcubs throughout the baseball season. "Our fans are what make this ballpark a success. They're the best fans in the Minor League," Hart said. "Over the years, we've seen how much they embrace Four Winds Field as a way to spend time with friends and family. We can see it by the amount of fan gear they wear, by how many people follow the South Bend Cubs through the season on social media, and by how many times our games are sold out. We're proud to be part of our fans' lives-they are a part of our lives." The South Bend Cubs open the 2019 season with a 2-game homestand on Thursday, April 4th and Friday, April 5th vs. West Michigan. Both games include special promotions and post-game fireworks. View sample fan photos by clicking here.